Now 86 languages and 29 Mundarts. The famous comic Asterix and Obelix have been published in many languages; we list them below. Albums are listed in order of the local publishing date, which differs in most cases from the origional publishing order in France. 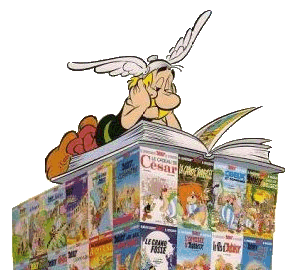 You won't find Asterix serialized in magazines together with other comics. The Complete Asterix Guide, ordered by language and ready to print! Translated titles, ordered by language. Translated titles, ordered by book. 23 Obélix et compagnie (1976) / Obelix and Co.